‘This is a large, coarse pear, of a roundish-obovate shape, five to six inches long and four or five broad. The flesh is somewhat tender and juicy, but without any aroma, and very soon becomes mealy. Not worth growing. Ripe in November and December.’ [Hogg – Fruit Manual p.168/1860]. ‘This pear was found in 1848 upon an estate purchased by M. Thuerlinckx, Mechlin, Bel.’ [Pears of New york p.563]. Figured and described in Le Jardin Fruitier du Muséum [JFM vol.5/1863]. It is also figured in Album de Pomologie [ADP vol.2, pl.99/1849], from which the illustration is taken. 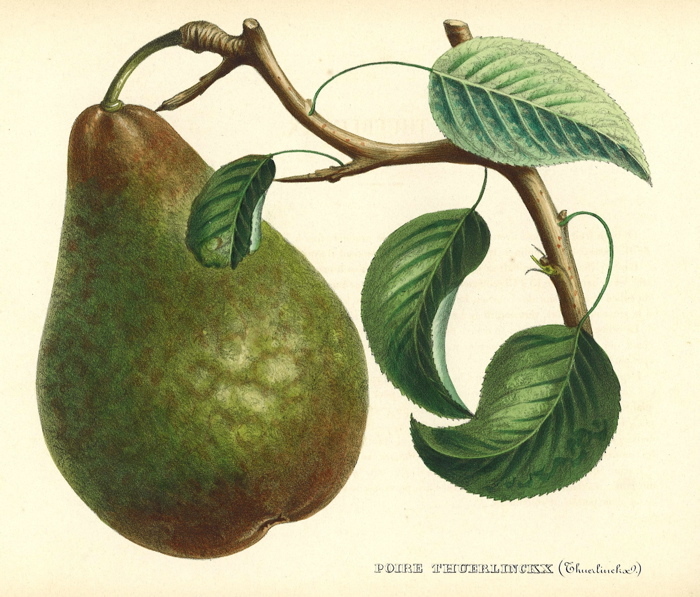 Listed only in the 1857 catalogue in an Addendum as ‘Beurré Turlincka’ [Pear no.43/1857]. In a copy of the 1857 catalogue the number ‘43’ is changed to ‘46’ and this aligns with the diary numbering. ‘46. Enormous pears as large as Uvedale’s St. Germain (No. 13), is a good dessert pear.’ [Diary B, MP A2951/1862]. Obtained from Veitch’s Nursery, probably the original Exeter premises, arriving very shortly after its discovery and introduction to nurseries.